Search Engines like Google let users refine their search based on keywords that are near to the searched keywords.Wordpress search is on the other hand lacks search filtering capabilities but gets the results based on the keyword and sometime if the posts are not well categorized unnecessary posts could creep into the results or some posts might get missed from the results.Similar to Google’s keyword refine suggestions you can also help your visitors find content more easily by a filtering option for the search result using the Search Filter plugin for WordPress. This plugin gives the user an option to filter results based on category, tags, or date, which can very user friendly and help the user find what he’s looking for.The plugin though has no options page and displays all 3 options for filtering by default.If you want to show only filtering by categories then you need to edit the plugin. Place ‘<?php if(function_exists(‘search_filters’)) search_filters(); ?>’ in your templates. Filters switcher will appear after search. 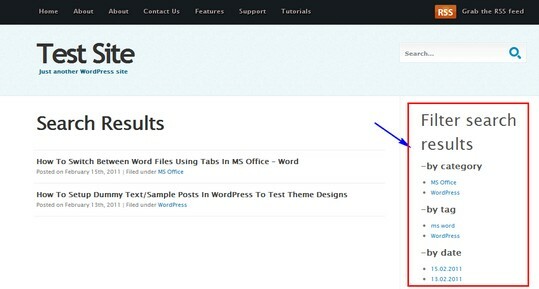 As mentioned earlier this plugin has no options page and no way of editing the CSS without editing the plugin file.The filter options can be placed either in the sidebar or just above the search results by placing the above mentioned code in the theme template.